Another aubergine (egg plant) recipe? You must think I am mad. Yes, every week when I go shopping if I see aubergines on offer I must bring some home. I bought four yesterday. I wanted to use half straight away because of limited fridge space and the other half later in the week. So what tickle my tastebuds this time? I want something guilt free (reasonably low fat), easy to make and tasty. Thought of baba ghanoush but I was reluctant to turn on the oven to roast the aubergine it's too warm. So back to oriental recipe. Then I thought of mashing it then dress it with oriental sauce. Quite yummy, soft and easy to eat. So here is what I did. 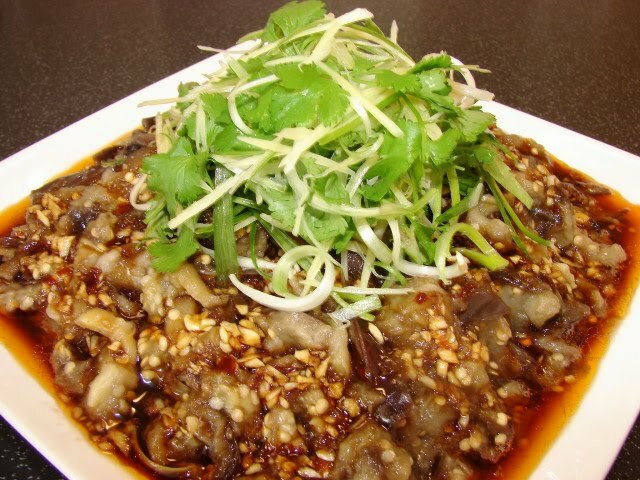 It's simply called mashed aubergine salad 'bun chair nee 拌茄泥'. Once the aubergine is mashed it's not a lot so I cooked two at once. * other names for vegetarian oyster sauce is stir fry sauce or mushroom (oyster) sauce. Using a pointed sharp small knife score the aubergine skin lengthwise into very fine thin strips. The reason why I score the skin is when the aubergine is cooked and then mashed the skin will form into long thin shreds. If you do not score the skin it will leave as big pieces. Remove the stalk and cut the aubergine lengthwise into halves. Straight onto a steamer rack. Steam for about 20 - 25min or till very soft and tender. Remove and leave to rest for few minutes, there may be some juice running out remove this juice. Then using a fork or a pair of chopsticks lightly tease/ mash/ fork through the aubergines into shredded mash. Do not mash it too fine. 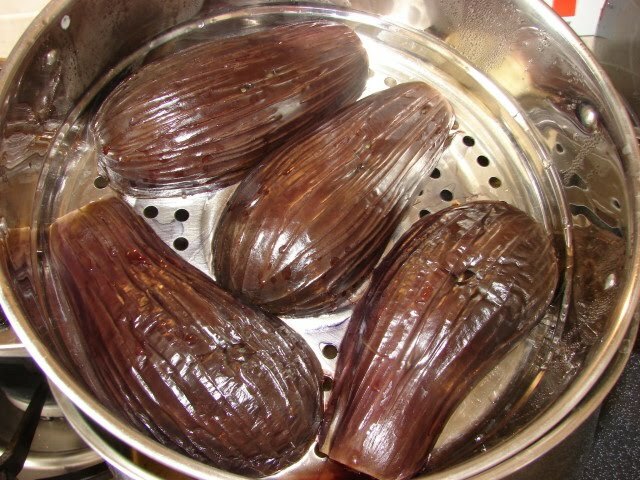 Here is a picture when the aubergines just been cooked. While steaming the aubergines, make the sauce. Mix everything together and leave aside. Finely shred (about 2" long) the spring onion and ginger. Cut coriander into 2" long. Tip: Soak the finely shredded spring onion in cold water the fine shreds will curl up prettier as garnish. To assemble the dish. Pile the mashed aubergine onto a plate. Pour on the sauce/dressing. Either scattered the garnish all over the aubergine or pile it up high at the centre like the picture shown. There's no such thing as too much aubergine! Great-looking recipe. Thanks Lizzie. Glad to know I am not the only one mad about aubergine. I'm with Lizzie — no such thing as too much aubergine. Great tip re scoring the skin of the aubergine; I never thought of that before, but it makes a lot of sense. Yep, another aubergine obsessive here! I'll definitely try this. I have so many of your recipes bookmarked now.